Natural gas-powered bus in Delhi, India. Photo by archer10 (Dennis). Natural gas might help public transport to pollute less. It might be a cost effective solution as well. 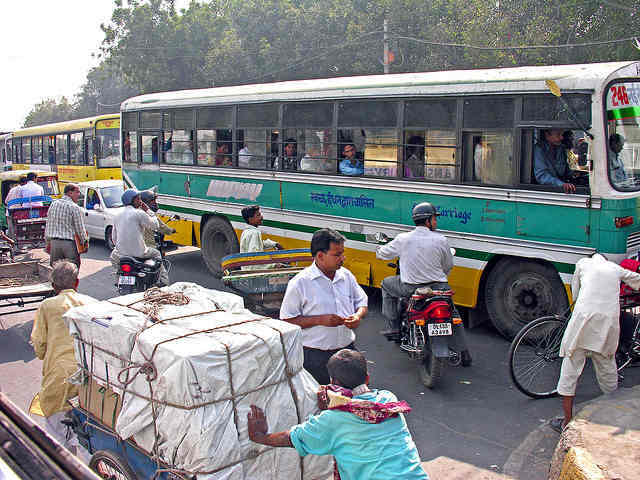 The Indian government mandated natural gas in 2004 for all public buses and rickshaws in a number of cities, but was mandating it really a good idea? There are other fuel options that may work better for various contexts. An alternative to compressed natural gas is diesel that has seen its sulfur content heavily reduced, also called low-sulfur diesel. Are the most advanced filter technologies compatible with diesel? Yes. Multiple government agencies have proven it can, including the U.S. Environmental Protection Agency and India’s Environment Pollution Prevention and Control Authority. Manufacturers, like TATA in India, have also asserted that filters work well with diesel. Although filter efficiency decreases with higher concentrations of sulfur, filter manufacturer Engelhard, for instance, claims that their filters can even work on diesel that has not a low sulfur content – for example 500 parts per million (PPM) sulfur diesel fuel. Emission test results from the United States Environmental Protection Agency show that when a filter reduces exhaust pollution from 150 ppm to 3 ppm, particulate matter dips by 96 percent. No. For advanced filters to be effective it is essential to use diesel with minimal sulfur content. However, for many cities in India, the availability of very low sulfur diesel and the corresponding filtering technology is still limited and very expensive, and the government of Hong Kong asserts that low-cost filters have had very little impact on particulate matter reductions. Mid-game commentary: If a city has access to diesel with very low sulfur content for its fleet of public transport vehicles, then the filtering technology will work, making diesel a relatively clean option – even cleaner with the filter. But as recommended by the Partnership for Clean Fuels & Vehicles, if advanced fuels are not available it is not the most effective to add exhaust technologies. Cities should focus first on using better quality fuels. Do natural gas vehicles emit more of the small particles that cause cancer than diesel-powered vehicles? Yes. At least a couple studies, including a 2001 joint report by the British government, the Society of Motor Manufacturers and Traders, and CONCAWE (an association of European oil companies conducting environmental research), has shown that natural gas-powered vehicles emit only marginally higher amounts of finer particles — known as nanoparticles — than the highest-quality diesel technology. These findings have then heavily been used in propaganda against natural gas for public transport. No. Even with the most advanced filters, final exhaust from diesel-powered vehicles still includes extremely carcinogenic chemicals, as shown below by the German Environment Agency, in a 2000 study conducted by Nils-Olof Nylund and Alex Lawson. Mid-game commentary: The research thus far does not point to one conclusion. Diesel and natural gas emit different types and sizes of particles, which can be toxic in different ways. Diesel emissions contain more large-particle pollution, which has been subject to numerous studies, while natural gas emits slightly more fine-particle pollution — the nature and long-term effects of which are lesser known. So both fuels can potentially be sources of carcinogens, but some more than others, depending on the quality of the fuel and the filters used to trap particles. The bottom line is, emissions reduction technologies are important in reducing carcinogens. In the context of Indian cities, with very high particulate pollution, natural gas wins our round one. It emits less particles. While low-sulfur diesel is becoming available in some cities, it is not the highest quality fuel and therefore not able to compete with natural gas in reductions of particle pollution and human health risk. But diesel can do better, especially if low-sulfur diesel was more widely available. In India, fuel quality is a big issue — thus, broadening access to higher-quality fuels would be the best course of action at the present time. It is clear also that more research on the effects of fine-particle pollution is needed to understand potential risks involved with natural gas emissions. For more info on the debate, check out EMBARQ’s Exhaust Emissions research or a recently published report from the World Resources Institute, on reducing methane emissions from natural gas.